It’s Molly and welcome back to the DIYer’s Guide! 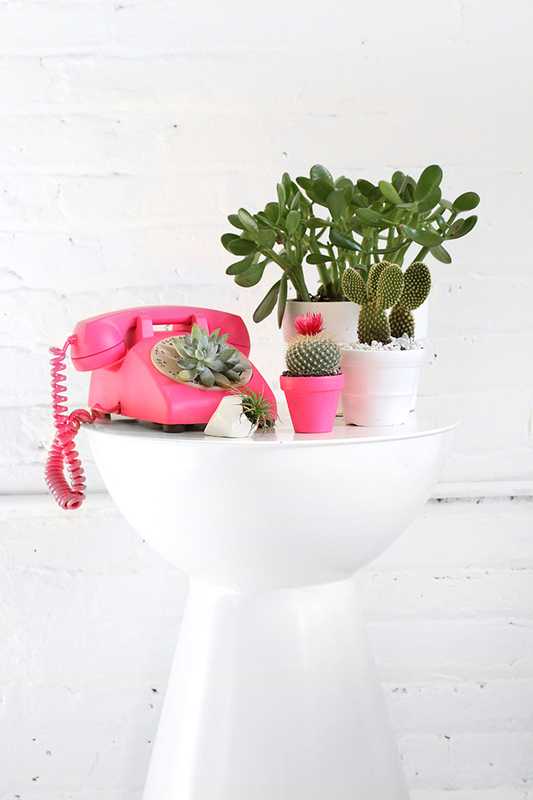 Although always perfectly manicured, I don’t have the greenest of thumbs and since we like to keep a lot of plants at the I Spy DIY studio, it’s important to know how to keep them happy and healthy. Beth Miller, owner of FORM Fine Goods, a Milwaukee-based floral boutique that carries unique flowers and finds, helped me dig up some plant care tips that will totally make the I Spy DIY garden grow! 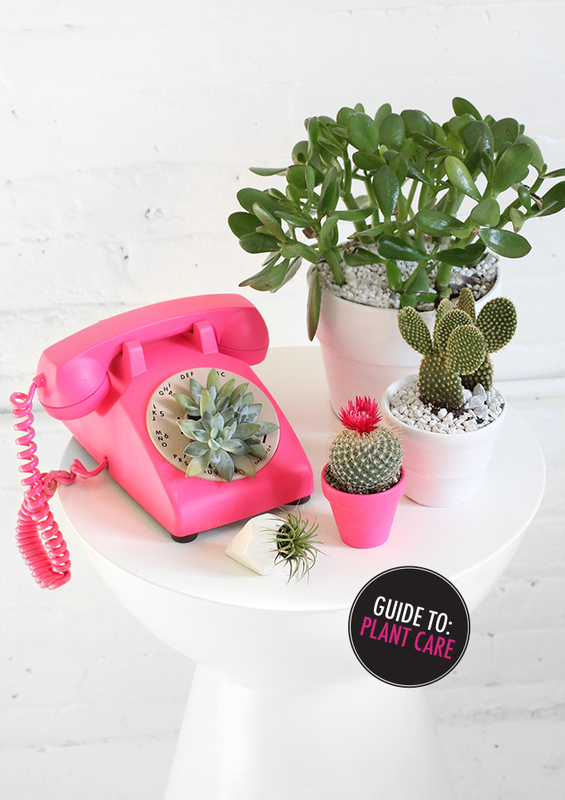 Succulents: Succulents are so cute and easy to maintain that you might end up spending all of your money on feeding your succulent obsession, (this succulent phone planter is one of our favorite succulent display) but remember these helpful hints when caring for them. 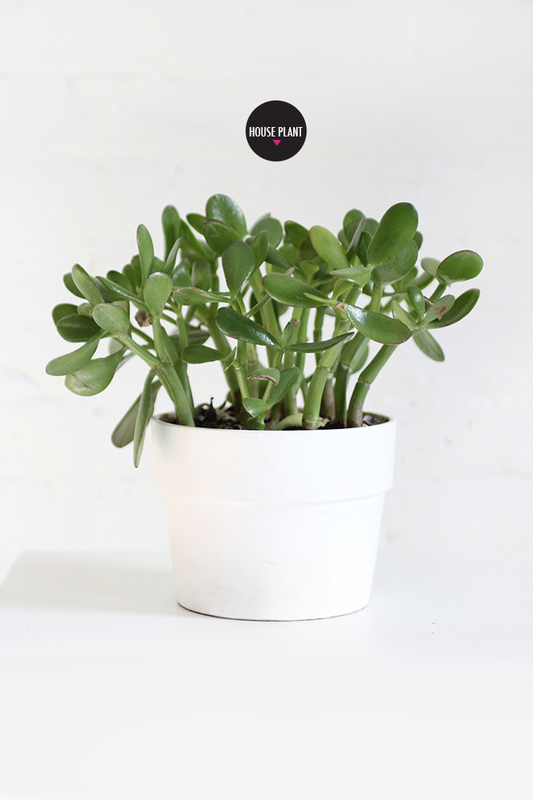 Succulents have fragile roots that can be killed by being over watered. To ensure that this doesn’t happen, let the soil dry out in between waterings and make sure there is proper drainage in whatever container you replant them. Beth suggests using a basic drill on decorative or repurposed pots to allow for such drainage. Summer is the succulent growing season, so they will need more water during this period as opposed to winter when they dry out less often. 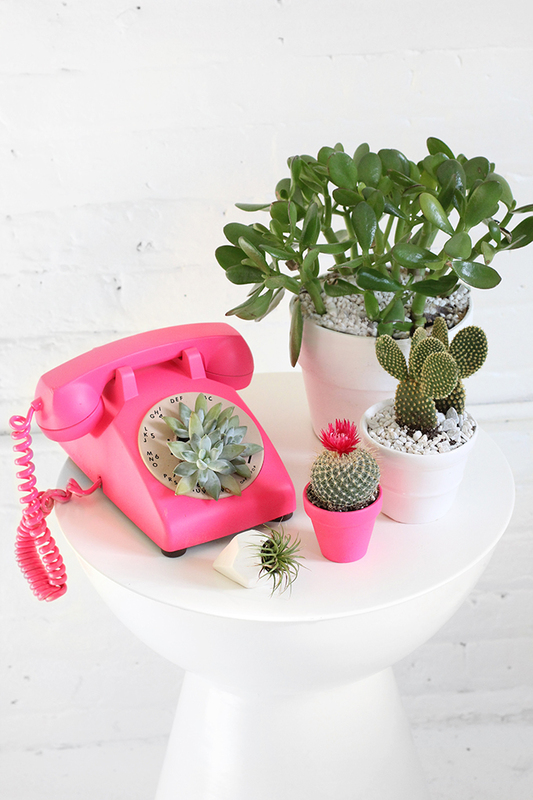 Pro Tip: Find an area that receives bright, indirect sun to so that your succulent will thrive all year long. Air Plants: If your idea of a low maintenance plant is a silk floral arrangement, you might be ready to step up your game with a carefree air plant. While air plants can survive for long periods of drought, they must be watered regularly. 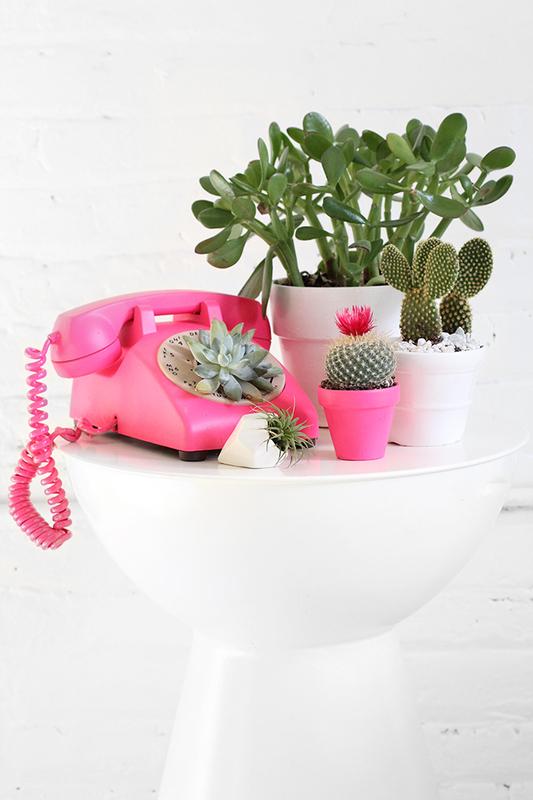 Once a week, fill a bowl with water and let the plants soak for 20-30 minutes. After they’ve taken a dip in the hydration station, shake the plants to remove any excess water from the base or the leaves. If you live in dry or hot climate, more frequent watering will be needed. Just be cautious of wrinkled or rolled leaves because that is a sign of dehydration. Air plants should be kept where they’ll receive bright, indirect sunlight. Periods of direct sunlight are fine, but be sure to move it after a few hours in the hot sun because it will diminish the plant’s moisture. 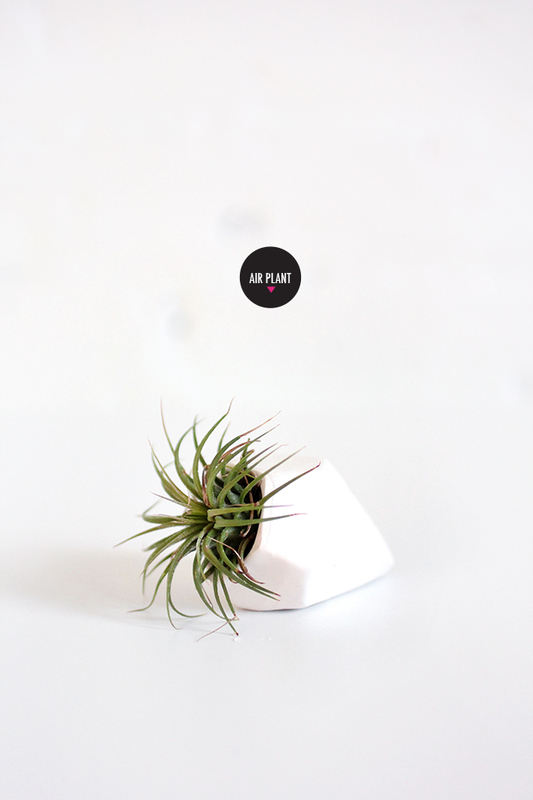 BONUS: There’s nothing cuter than a pineapple air plant holder! 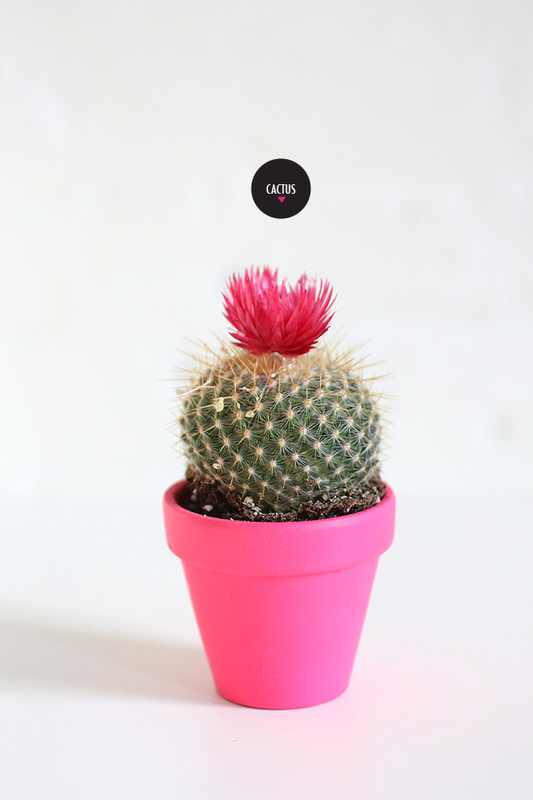 Cacti: If you are cautious of the prickers, cacti can be painless to care for….and they make for adorable cameos in room decor. From spring to autumn, place them in a sunny area that faces south, east or west. In winter, transition them to a bright and cool environment. Pro Tip: To avoid overwatering, place a thin wooden stick in the cactus’s soil. If the soil sticks to it, do not water. When you do water your cactus, make sure there is proper drainage in the pot. Place a bowl underneath the pot and dump out the excess once it has drained so that the roots don’t stay saturated. 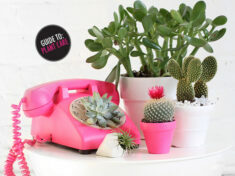 Houseplants: Houseplants come in a number of varieties, but surprisingly the upkeep for many of them is similar so you’re totally justified in turning your home into a greenhouse. For most houseplants, test the moisture by dipping your finger an inch into the soil. If it is dry, add water to saturate the surface. Also be cautious of repotting. Repotting houseplants allow them to flourish, but if you’ve just gotten a new plant, wait a couple of weeks before repotting it because plants need some time to get used to new light and temperature conditions. Once this adjustment period is over, place the plants in a south-facing window so that they will receive full sun and repot them every year. 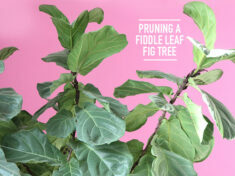 Fiddle Leaf Figs: The I Spy DIY studio is home to a fiddle leaf fig tree named Miss Fiddle and we always follow these guidelines to keep her happy and healthy. Fiddle leaf figs are found in sunny, hot climates with larger trees canopying above, so an environment with diffused sunlight is best. If the tree starts to grow in one direction, rotate the pot in order to expose the rest of the tree to sunlight. The best rule is to evenly water the fiddle leaf fig, without letting the soil dry out completely. If you keep the soil evenly moist and not soaking wet, a fiddle leaf fig will live a long life. 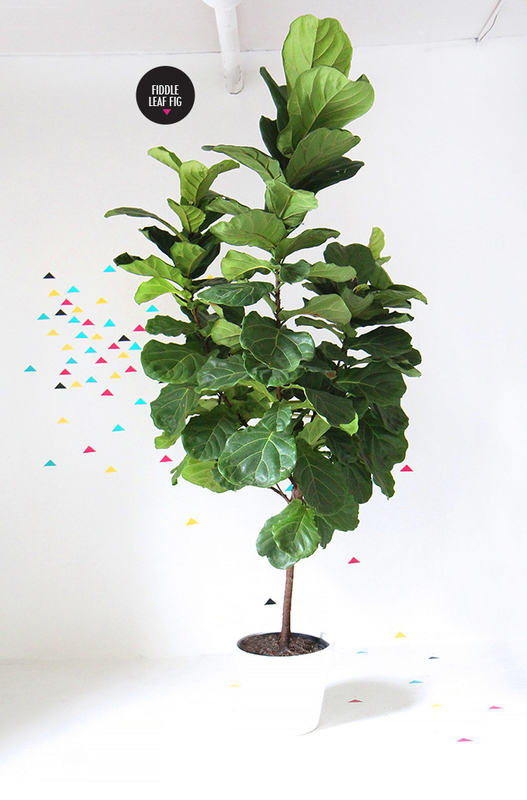 Pro Tip: Give the tree’s leaves a dusting every week so that no dirt particles settle and deter sunlight from reaching the leaves. 1. Plants can tell you when they are getting too much direct, hot sun. If there are any brown edges or spots on the plant, move it to a sunny area that receives indirect sunlight. If lower leaves turn yellow and fall off or if new leaves are smaller than existing ones, this is a sign that the plant is not getting enough sunlight. 2. If your plant’s leaves are falling off or wilting despite getting a lot of water, it is a sign that the roots are drowning. Ease up on the amount of water you give your plants to ensure that they can breathe. If you have any plant care tips, please share them in the comments below. Happy planting! 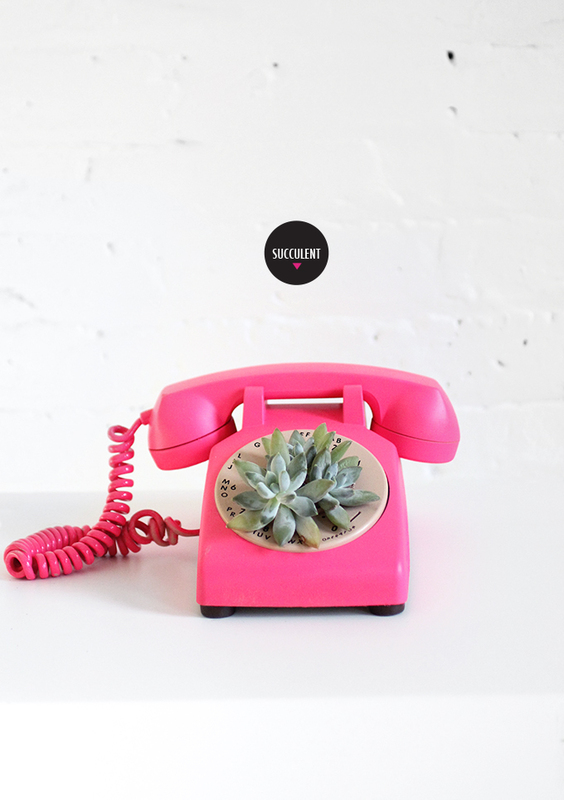 Molly, I am in deep love with the phone planter! 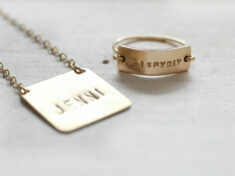 I can’t believe I missed such a fun DIY. I love plants, especially the ones that are easy to take care of. Definitely saving this. Thanks for sharing!